Holiday baking and food-gift making went into high gear last week. I have gone through quite a few pounds of flour, butter, and chocolate! In other words, I've been in a happy place and having a lot of fun. Let's talk about shortbread cookies. They truly get their moment in the spotlight at Christmastime. A lot of people tell me that shortbread is their favorite cookie and for some reason, I'm always a little surprised. But each time I eat it, I can see why. So this year, while I was trying to decide on the items to make for my homemade food gifts, I decided shortbread had to be on the roster. I think the beautiful thing about shortbread is it's delicious at its most basic, in its very essence of butter and vanilla, but it's also a great canvas for lots of flavorings and customizations. I've wanted to make an almond and orange version from Martha Stewart for some time so I went ahead and did it. In this case, the sandy, melt-in-your-mouth, shortbread is wrapped up in nutty almond slices and the perfume of fresh orange zest. It's the kind of simple flavor that appeals to me when I'm looking for an alternative to chocolate. That said, I also made last year's chocolate chip shortbread, which was too delectable to forget! With two options, I had my chocolate-loving and maybe not-so-chocolate-loving friends covered. 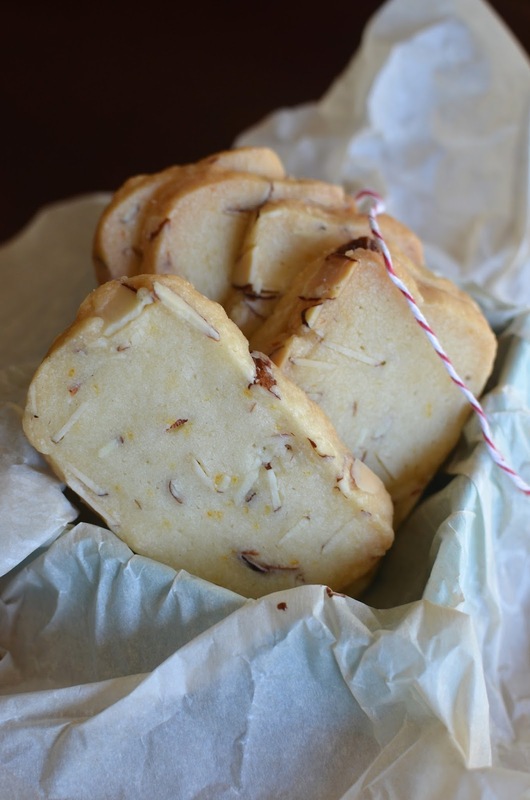 This almond-orange shortbread dough a cinch to make. It's a slice and bake type of cookie so once you shape the dough into its log, store it in the freezer until you need it, and you have ready-to-bake cookies on standby. I love how shortbread/icebox cookies are not only delicious but so flexible; you can make the dough well in advance and bake it when you need it. Plus, they keep well for a long time stored in an airtight container, making it perfect for gift-giving. So come Christmastime, it's definitely shortbread for the win! I sometimes wonder why I don't make slice-and-bake cookies more often. In this case, shaping the dough into a rectangular log makes life even easier. I made and shaped the dough, then stored it in the freezer, wrapped in wax paper as well as plastic wrap. When it was time to bake, I let the dough sit out for about 30 minutes, then proceeded to slice and lay them on the baking sheet to bake. Easy peasy! I try to keep an eye on them so they don't brown too much. They go from lightly golden around the edges to brown pretty quickly. For some reason, I love to take a look at the back of shortbread cookies. Instead of the smooth surface, you can see the sandy, crisp texture it promises to offer. I packed up the majority of our shortbread cookies (these as well as the chocolate chip version) for gifts, saving a few to enjoy ourselves. They are so rich and lovely to savor at this time of year. It's a luxury to be able to whip up homemade gifts and share them with some of our friends and neighbors. I hope you've been making or just enjoying some goodies this holiday season! I've been in the kitchen making a lot of favorites (recipes I've learned in the last few years) and trying a few new things, and it's been a great time. I've still got the all-important tri-color cookies to bake for my family this week and with that, this holiday and cookie-making factory will take a little hiatus. It's time to kick back and enjoy some lazy family time. I hope you and your family have a wonderful holiday!! In a stand mixer, beat the butter, confectioners' sugar, almond and vanilla extracts, and salt together until smooth. On low-speed, add the flour and orange zest. Mix until a dough forms. Gently stir in the sliced almonds using a rubber spatula. Scrape dough down onto a large piece of wax paper. Form it into a rectangular log, about 12 inches long, 2 1/2 inches wide, and 1 inch thick. Wrap the log in the paper and freeze until firm (at least 1 hour and up to 3 months). If freezing for longer than a day, wrap log again with plastic wrap. To bake, preheat oven to 325 degrees. Remove dough from the freezer. If it has been in the freezer for a long time, let dough sit out at room temperature for 30 minutes so it will slice without crumbling. Using a sharp knife, cut dough into 1/4 inch thick slices. Place onto baking sheet (ungreased is fine), about an inch or so apart. Bake until edges just begin to turn golden, 20-25 minutes. Let cool on baking sheet for 5 minutes, then remove cookies to a wire rack to cool completely. Store fully cooled shortbread cookies in an airtight container, at room temperature. You too have a great holiday season, Monica! Thank you - have a joyful holiday! These look awesome! I'm not a huge fan of plain shortbread cookies, but when they have a little extra fun flavoring in them, I'm all in! I love shortbread, these look so pretty and they're so neat too! Thanks! They are so easy to make and such a good treat. Shortbread is the BEST gift! These sound and look lovely! I am shocked to hear that you have friends that are not-so-chocolate-loving! Very open minded of you, Monica. ;) Then again, I think we are friends and I don't eat nuts. Perhaps almost as shocking. :)Have a fabulous holiday! Yes...I am open minded and inclusive that way, Wendy! ; ) I have to admit it does shock me when friends (and family!) don't love chocolate like I do...but to each his/her own! Same goes for nuts. : ) Thanks for stopping by, Wendy. Glad to hear it...thank you! I should have eaten before coming over here to see what you baked up! I am drooling - these cookies look perfect and love the shape too. What a wonderful gift! Shortbread is most definitely a staple at our house come Christmas! The almond orange flavor combo sounds soooo good! I hope you and your family have a wonderful Christmas Monica!! It is a nice alternative to add a little flavor, not too much. Hope you're relaxing and enjoying time with family, Ashley! Thank you. I have gone through SO much butter and flour it's not even right! LOL Ok I may need to add one more cookie to my trays now! Merry Christmas to you and yours, too, Juliana. Thanks for swinging by. Ahh, shortbread is so classic. These look very beautiful, almost crispy. I would love to receive a box of these for Christmas...yum!! Thanks, Bonnie. Christmas is definitely a time for some of the classics. Happy holidays to you and your family! Hi Kelly - thanks for stopping by. I hope you're enjoying some much-deserved, relaxing time with your family over the holidays! Eat plenty of cookies and drink lots of hot chocolate! Cheers! Short bread cookies are the best. I hear ya, I wonder why I don't make them often too. This shape is so lovely Monica, so neat looking. I love your additions to the traditional shortbread, orange is always a great addition, so fresh. Your week sounds so special, nothing like baking treats for friends and family, so satisfying. Thank you, Asha. I have had a blast baking during the holidays...now I'm just looking forward to kicking back with my family for the next few days. Such a great time of year. Thanks for all the kind words this year...enjoy time with your loved ones! Love a cookie dough that can be stored in the freezer. The almond/orange flavor sounds so good! Hope you have a very Merry Christmas! Christin...I'm just thinking that each time you stop by, I happen to have an almond recipe!? Good thing you like almonds. : ) All the best to you and yours...have a wonderful Christmas! Shortbread cookies are one of the best! It is great that they can be made ahead. Almond and orange sounds really nice together. A batch of these cookies will make me very happy! ;) Have a sweet holiday! You never know when people will get to your cookies since there are so many treats hanging around this time of year...so something like shortbread is great with its longevity. : ) Hope you have been enjoying the season and making tons of treats to enjoy with your family! Happy Holidays and Merry Christmas dear!! Beautiful short bread cookies. Love the shape and color. They look irresistible. It looks better than store bought. Yum Yum. Thank you! Hope you had a great Christmas. Happy New Year to come!! Happy holidays! These look incredible Monica:) Really love them! Hi Monica, shortbreads are my favorite though I have noticed the older I get the less I can consume. Happy holidays to you and your family. Say it ain't so...it's true we just can't gorge like we did when we were younger...but we're wiser, right? There's always a trade-off. : ) Well, here's to a happy and healthy New Year, with lots of good quality eats! You make the cutest shortbread, it looks like perfect bakery kind! Happy Holidays to you and your family! Hope you had a lot of yummy treats during Christmas. Thanks! Hope you had some! Happy holidays!